Four years after the recession officially ended, the economic recovery remains a long way off in the view of many Americans. A new survey by the Pew Research Center, conducted July 17-21 among 1,480 adults, finds that 44% say it will be a long time before the nation’s economy recovers. 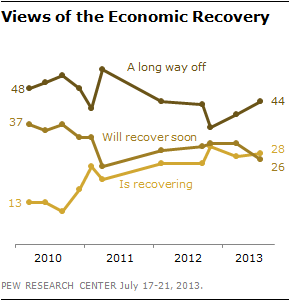 Smaller percentages say either the economy already is recovering (28%) or will recover soon (26%). These opinions are little changed from March. But last October, shortly before the presidential election, fewer Americans (36%) said it would be a long time before the economy recovers. At that time, 61% said the economy was already recovering or would recover soon; today 54% say this. Opinions of current economic conditions, which had improved modestly in June, have slipped back to levels from earlier this year. 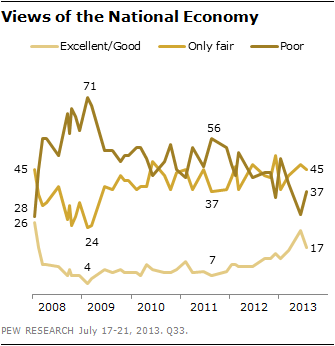 Currently, 17% say economic conditions are excellent or good, while 82% rate them as only fair or poor. In June, 23% rated the economy as excellent or good, the most positive measure in more than five years. The survey finds that Barack Obama’s overall job rating, which was more positive than negative in both May and June, is now evenly divided: 46% approve of his job performance while 46% disapprove. Views of Congress remain historically negative: just 21% have a favorable opinion of Congress while 70% view it unfavorably. Opinions of Congress fell to a 20-year low in August 2011, following the contentious debate over raising the nation’s debt ceiling, and have never recovered. Large majorities across nearly all demographic and partisan groups have an unfavorable impression of Congress. About seven-in-ten independents (73%) view Congress unfavorably, as do 69% of Democrats and 67% of Republicans. Notably, unfavorable opinions about Congress are about as widespread among liberal Democrats (79% unfavorable) as among Republicans and Republican-leaning independents who agree with the Tea Party (81% unfavorable). And views of both political parties are negative on balance. For the Republican Party, this is nothing new: Currently, 33% view the Republican Party favorably while 58% view it unfavorably. That is identical to opinions of the GOP in January, but continues to be among the most negative ratings for the party in more than 20 years of polling. 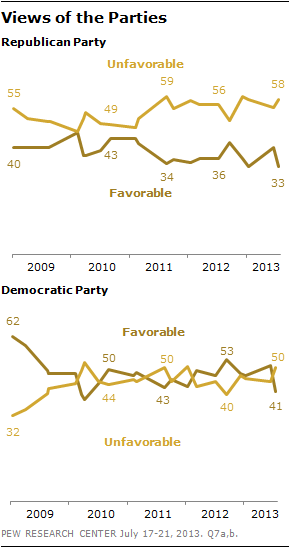 Opinions of the Democratic Party, meanwhile, are more unfavorable than favorable for the first time since January 2012: 41% view the Democratic Party favorably, while 50% view it unfavorably. The Democratic Party continues to hold a favorability edge over the GOP, in part because Democrats have a more positive view of their own party (78% favorable) than Republicans have of theirs (70% favorable). Independents have about equally low regard for the Democratic Party (32% favorable) as the Republican Party (31%). Views of the national economy had been on a positive trajectory until this month. The percentage rating the economy as excellent or good had risen from 13% in January to 23% in June, before falling back to 17% in the current survey. The share rating the economy as poor fell 20 points – from 49% to 29% – between January and June; currently, 37% view economic conditions as poor, up eight points from a month ago. Nonetheless, perceptions of economic conditions have become much less negative since the early months of Obama’s presidency. In February 2009, 71% rated economic conditions as poor, the highest percentage ever in a Pew Research Center survey. Almost two years ago, 56% said the economy was poor, 19 points higher than today. The public thinks that the economic recovery has yet to take hold: 28% say the economy is recovering, 26% say it has not yet recovered but will soon and 44% say it will be a long time before the economy recovers. People with higher family incomes are more likely than those with lower incomes to say the economic recovery is underway. About four-in-ten (41%) of those with incom es of $100,000 or more say the economy is recovering as do 34% of those with incomes of $75,000-$99,999. Just a quarter of those with lower family incomes say the economy is recovering. Partisanship also is a factor in these opinions. About twice as many Democrats as Republicans say the economy is recovering (38% vs. 17%); Republicans are twice as likely to say the recovery is a long way off (56% vs. 28%). Republicans’ views of the recovery have changed little since October, when 52% said it would be a long time before the economy recovered. But higher percentages of Democrats and independents say the recovery is a long way off than did so in October, shortly before the election: 28% of Democrats express that view currently, up from 18% then. 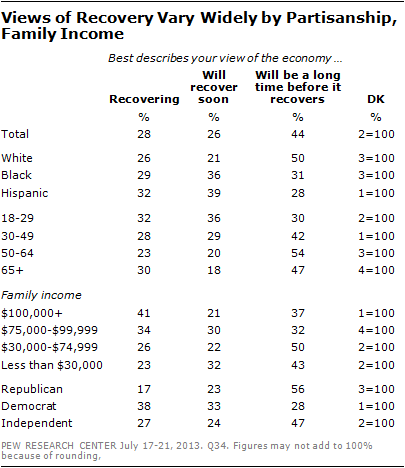 Among independents, 47% say recovery will take a long time, up from 40% then.